My Auntie K has been a major supporter of my sweet tooth since I was young, and has been spoiling me with baking supplies from Williams Sonoma since I was a kid. I attribute much of my love of baking to her, and think of her fondly whenever I use my stand mixer, melamine mixing bowls, ice cream containers, and most recently, a second ice cream maker attachment! Yes, this means I think of her a lot. Thank you, Auntie K! She also cooks like a boss. Seriously, what more could you ask for in an aunt?? I always look forward to meals at her home, because not only do I get to spend time with my family, but I know there will always be something tasty and delicious served up. 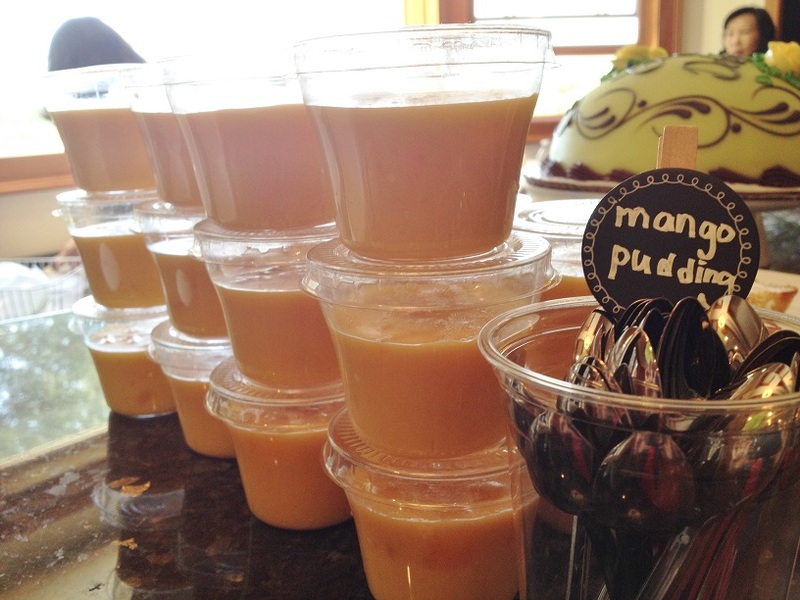 A few years ago, she made this amazing mango pudding. My husband went crazy for it, so I had to ask for the recipe. Happily, she’s the kind of lady who says things like, “Absolutely, recipes are meant to be shared and enjoyed!” So when friend after friend kept asking me for this recipe, I was happy to oblige. This pudding is so good that my friend’s mom, who has never actually tried it herself, decided that she needed to make it for other people. This pudding is so good that my friend thinks it’s family secret recipe-worthy. …mango pulp! 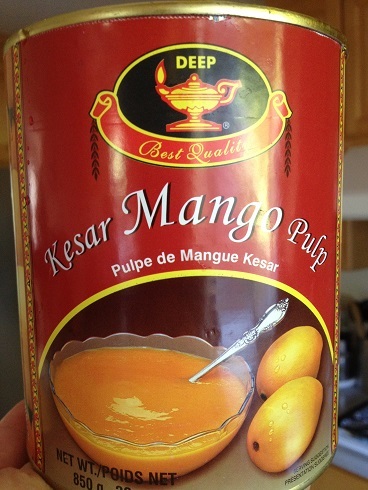 Cans of mango pulp can be found at most Indian markets (or here on Amazon ), and my aunt recommends the Kesar variety, so I’ve always gotten that. Like a good fruit tart, this is the kinda dessert that “not dessert people” seem to also enjoy. It’s light on the sweetness, and the freshly diced mangoes make it a perfect summertime treat. I made these for my dear friend Debbie’s bridal shower this past weekend. Usually, I serve this dessert in individual ramekins and/or by scooping portions out of a 9″ x 13″ tray and squirting some evaporated milk on top with a squeeze bottle . However, I wanted to pretty things up for this event, so I got some dessert cups with lids and mini tasting spoons , which also made it easier to serve at the shower. This makes a generous batch, so you’ll want to bring it to share with lotssss of friends! I enjoy it served with evaporated milk, but you can also have it without. You do have to go out of your way to pick up a couple of unusual ingredients (mango pulp and gelatin ), but after that, it’s a cinch to put it all together. The most time-consuming part of this recipe is dicing the mangoes. Other than that, you just stir and chill! Thanks again for sharing your delicious creation with us, Auntie K! Mix sugar and gelatin. Dissolve with hot water. 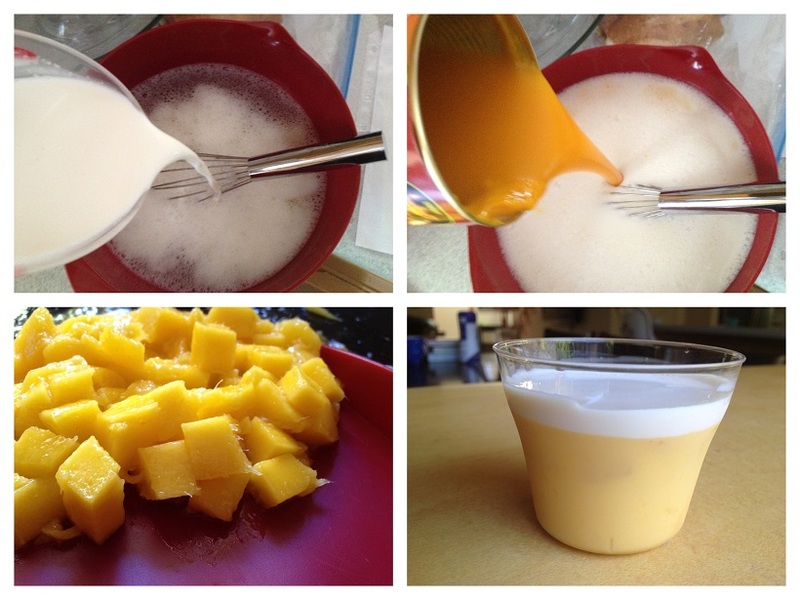 Pour in milk, heavy cream, mango pulp, and fresh mangoes. Stir. 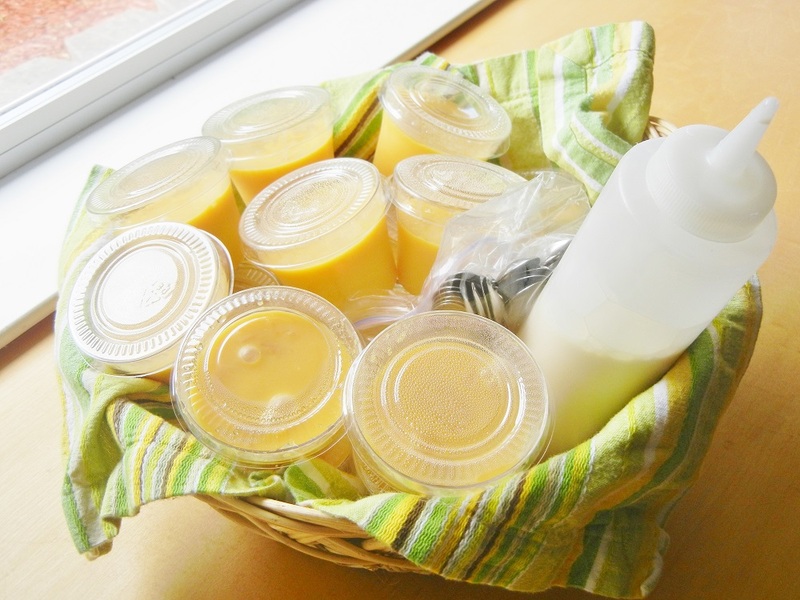 Pour into a 9″ x 13″ tray, refrigerate for at least 3-4 hours before serving. *If you like it firmer (jello-like), use 6 tablespoons of gelatin. If you prefer it softer or pudding-like, use 4 tablespoons. sounds like a great recipe! may I know whether we should put into the freezer? or just the cooler department will do? Also, if I pour it into a tray, how do I transfer into cups? Thanks! Chill in the refrigerator (cooler department?). If you want to serve them in cups then you should pour them in there first when the mixture is still liquid, and then chill it in there to set. Hope you enjoy it! Hm… if I were you, I’d try to peal/pit and then puree real mangoes until they’re liquid, to replace the mango pulp. Feel free to halve or even quarter the recipe, as the original recipe makes a ton! Do you know how long the pudding keeps in the fridge? I made a batch and there’s just too much for us to finish in one go. Very delicious…wish I had fresh mangoes to chop up onto it. Hmm… I wouldn’t keep it for longer than a week? I know– this batch makes a TON. I always make sure I have friends to share it with before I make it now haha :). So glad you’re enjoying it! 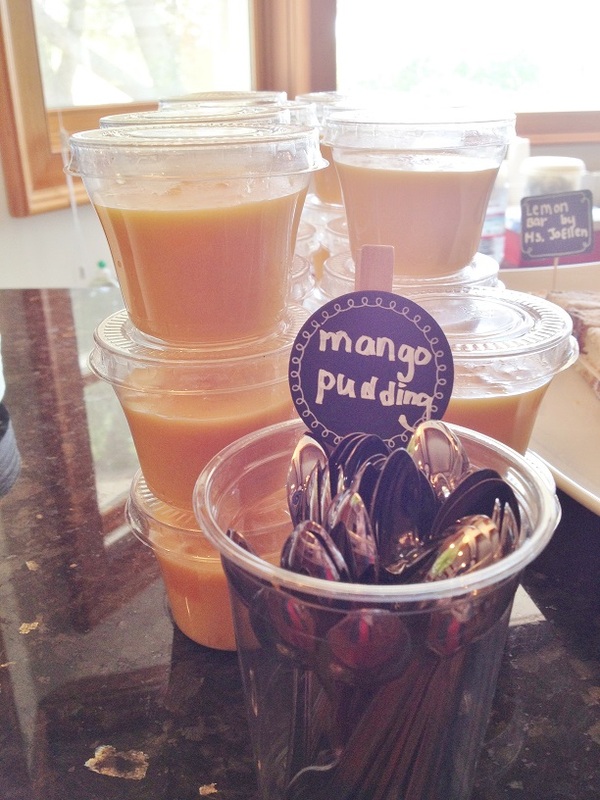 Hey there, stumbled across your blog when I was searching high and low for the perfect mango pudding recipe. This has been far the best. I just had some trouble- my creamy part and mango were seperated. Am I meant to let the gelatin cool down before I add the milk and the rest? Its like a curd sitting on top. Hope to hear back from you soon! Yay! Glad you like it! I have never had the separation problem. However, to speed up the cooling-down process, I only dissolve the sugar/gelatin in 2 cups of hot water before adding the rest of the ingredients, including the remaining 4 cups of (room temperature) water. I’ve tried both ways, though, and never had the separation problem. Are you sure you have mango pulp (not nectar)? Not sure, just guessing at what could be the culprit. Good luck! I have a same problem with you. The mango pulp (i use fresh mango and blender it) and when i add to my gelatin batter the mango didnt really combine so i use whisk to combine them and it works! 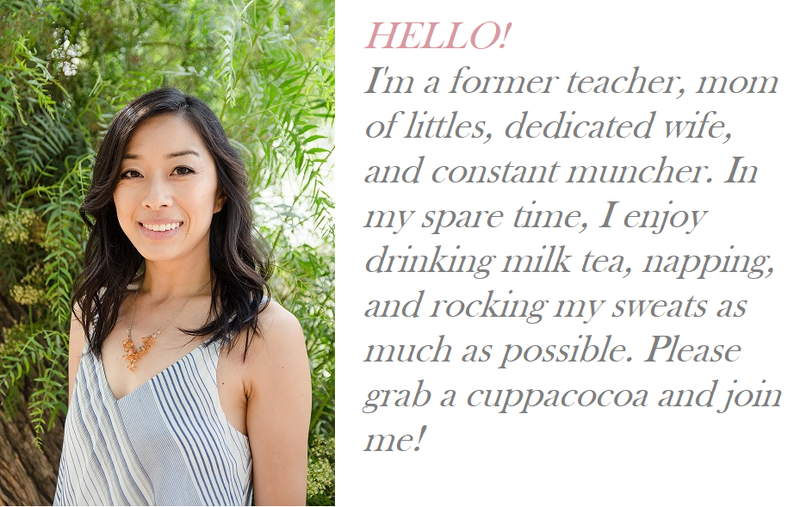 Hi Jo, thank you for giving me so much credit but you are such an awesome baker/cook that you’ve way exceeded my cooking abilities, I now look to your blog for inspiration. BTW, I LOVE your blog! As for the Kesar pulp from Amazon, that will totally work, actually that is even cheaper than when I “bargain” the shop keeper for a case of 6 cans of pulp, which is $18. No way! I still pick up new stuff from you all the time! Thanks for the note on the Kesar pulp! Thanks for being a great auntie! Very cool… thank you for the tip!